Consumer spending is the engine that powers the American economy, accounting for about 70 percent of all activity. An uptick as small as 0.3% can cause the Federal Reserve to reevaluate its plan on raising interest rates. 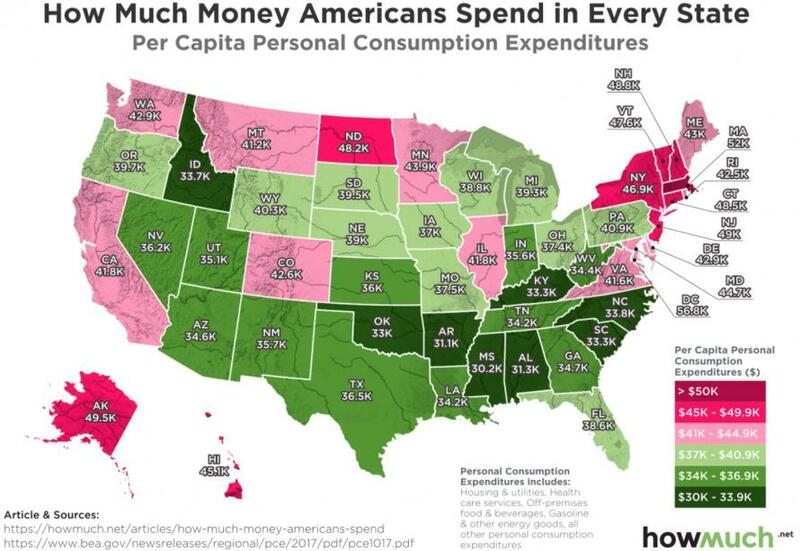 Since looking at these numbers in aggregate can tell you a lot about the economy’s direction, we thought we’d break down personal consumption at the state level. As HowMuch.net notes, this reveals an interesting snapshot about the economy. The Bureau of Economic Analysis— part of the U.S. Department of Commerce—published new numbers in October 2017 tabulating how personal consumption has changed year-over-year. This includes things as wide ranging as housing and utilities, health care expenses, and eating at restaurants. We color-coded each state based on how expensive it is there—green states are comparatively cheaper, and red states are more expensive. This approach gives you a good idea not only how much things cost, but also a thing or two about the economy at the state level. There’s also a collection green states across the Deep South to the Southwest, stretching all the way from North Carolina ($33,779) to Nevada ($36,177) and even up to Oregon ($39,742). The cheapest place is Mississippi, where it costs only $30,200 to pay for life’s most common expenses. Florida is the only state in the Deep South where it costs more than $37k. Keep in mind, Florida’s warm winter climate makes it a prime candidate formigration, which increases personal consumption.. There are a few other fascinating stories that you can infer based on our map. Take a look at Alaska ($49,547), the third most expensive state. There’s no doubt Alaska’s location far away from the contiguous United States plays a large part in driving up housing and health care costs, but who knew it costs more to live in the Last Frontier than New Jersey? Another standout is North Dakota, the seventh most expensive state in the country. It’s no coincidence that both Alaska and North Dakota have enormous oil wealth, which only puts upward pressure on prices. In fact, oil extraction in Alaska is only going to grow in the New Year. The big takeaway from all this is that no matter where you live, you need a decent amount of money to make ends meet. Exactly how much depends on where you live, but you need more than $40,000 in 28 states, and more than $50,000 for two (if you count Washington, DC).